Electronic book readers can be a great way to encourage children to read. E-readers make reading easy and fun as they can store thousands of books. Also,if a child stumbles across a word that he cannot understand, readers usually have an in-built dictionary that allows them to find the definition of the word instantly, thereby increasing their vocabulary. There are other benefits associated with e-book readers. Some readers can be used to read magazines and newspapers. Also, book readers do not hurt the eyes and thanks to the e-ink technology their screens look like the pages of a book. There are so many e-book readers in the market today that it is easy to get lost. We recommend the most recent e-book readers as the technology is always progressing and the most recent readers have more features. We also like the e-book readers with larger screens (6 inches and above) as larger screens make the reading experience more enjoyable while we recommend the 5 inches screen for e-book readers used in travel. 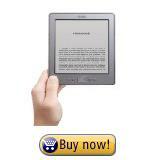 When choosing an electronic book reader, you should also consider its weight. You should decide between an e-ink screen or an LCD screen. E-ink screens are black and white, they reproduce the look of a printed paper, they don’t tire the eyes and they can be read in direct sunlight, something that you can’t do with an LCD screen. LCD screens on the other hand can be read in the dark and they refresh quicker. E-ink technology duplicates the experience of reading a book. Can store thousands of books. If you are looking for an electronic book reader to be used just for reading, we recommend a black and white reader with e-ink technology such as the Amazon Kindle that duplicates the experience of reading a book. Another advantage of this e-book reader is that it is very light (under 6 ounces). 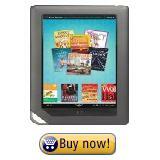 If you are looking a little more sophisticated electronic book reader, the Amazon Kindle Keyboard 3G is a great choice. It is slim, it has lots of memory (4 B), it has free 3G internet access worldwide, and most of all, it has a keyboard which makes it easy to use. We also recommend that you get a cover with built-in light so that you can read your Kindle at night. If you are looking for a reader with even more functionality, a color screen and a variety of media applications, then the Amazon Kindle Fire is your choice. The Amazon Kindle Fire also has more battery life. However, if you want an e-ink screen which looks like a printed page, you have to be aware that the Kindle Fire has a color LCD screen (and not e-ink). The lightest ebook reader in the market. 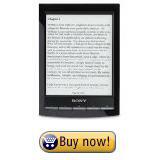 Another brand that we recommend is Sony and more specifically the Sony Reader PRS-T1. It has a touchscreen interface, e-ink technology, a beautiful high quality Sony design, 3 week battery life and WIFI connection with a web browser. The only downside is that its e-book store is not as large as the Kindles and the Sony reader tends to be more expensive. For travel, you can get the Sony Reader Pocket Edition Silver PRS-300SC with its nice silver color (also available in pink). Don't forget to also get the cover with the light. Can store up to two million books. Access to the Barnes and Nobles library. Another e-reader with color screen is the Barnes & Noble Nook Tablet. What we like about the Nook tablet is its library which contains two million titles versus a little less than one million titles for the Amazon store.